Guests will immediately be impressed with the YACHTSMAN’s elegant and huge interior. Your most discerning guests will be impressed once they step inside the YACHTSMAN. 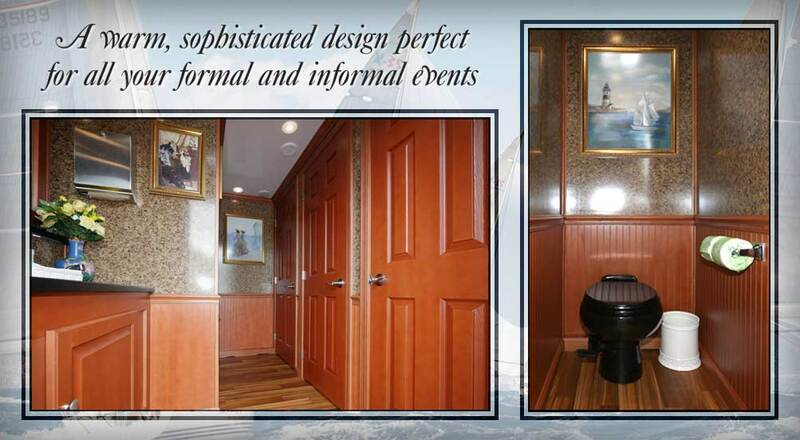 Stunning custom framed yacht-themed paintings decorate the walls and stalls throughout the entire restroom. 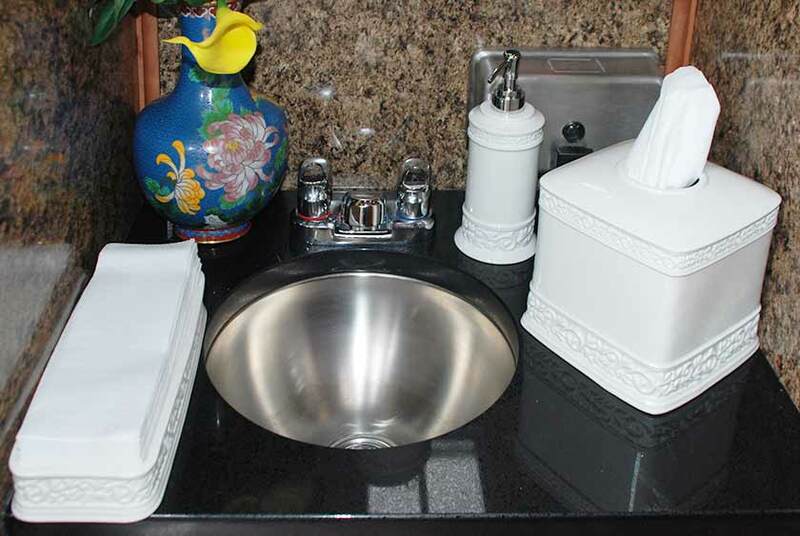 Vanity sinks decorated with beautiful florals also include soap and towel dispensers, tissue holder, and candy dish. Guest will feel like they stepped into a restroom inside one of the world’s finest hotels. 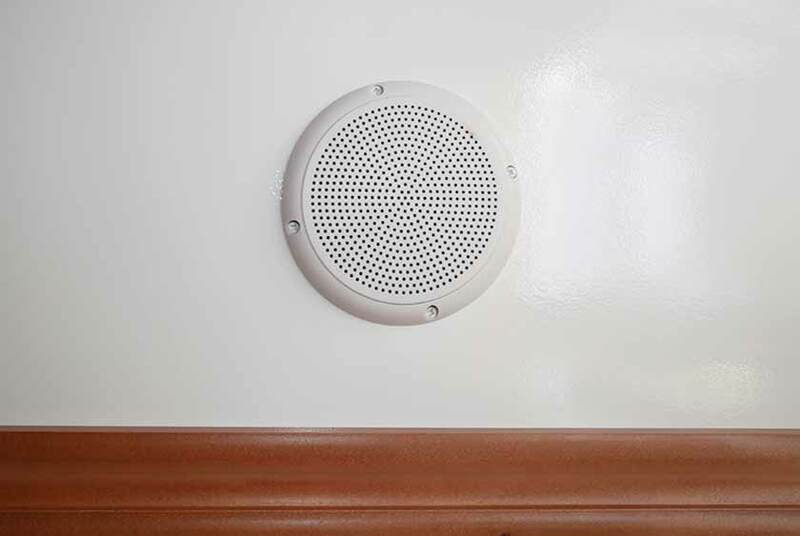 A music system with ceiling installed speakers is also available for your guest’s enjoyment. 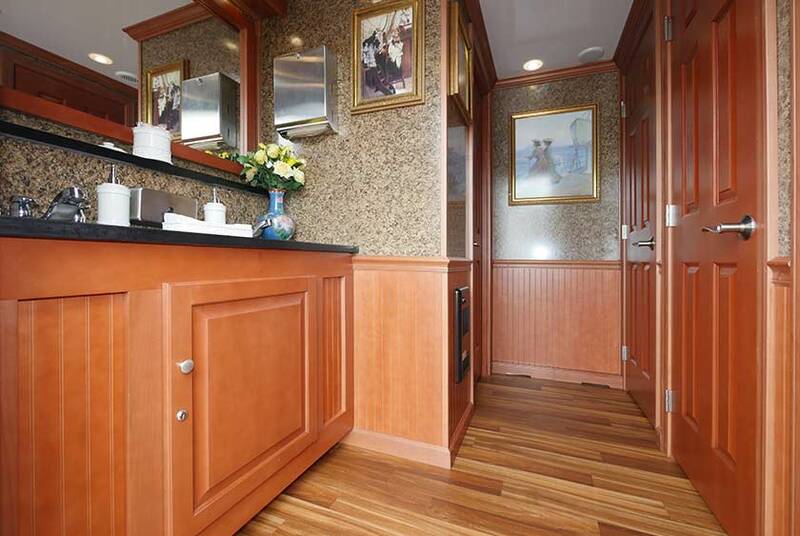 The warm, sophisticated design of the YACHTSMAN Luxury Restroom Trailer includes wood wainscoting up to the 3-foot height. 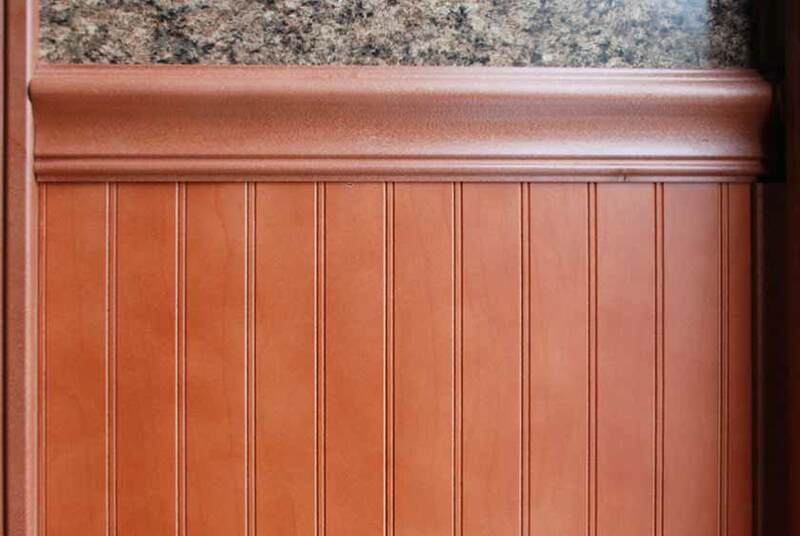 Details continue with wood base moldings, chair rail moldings, and crown moldings. 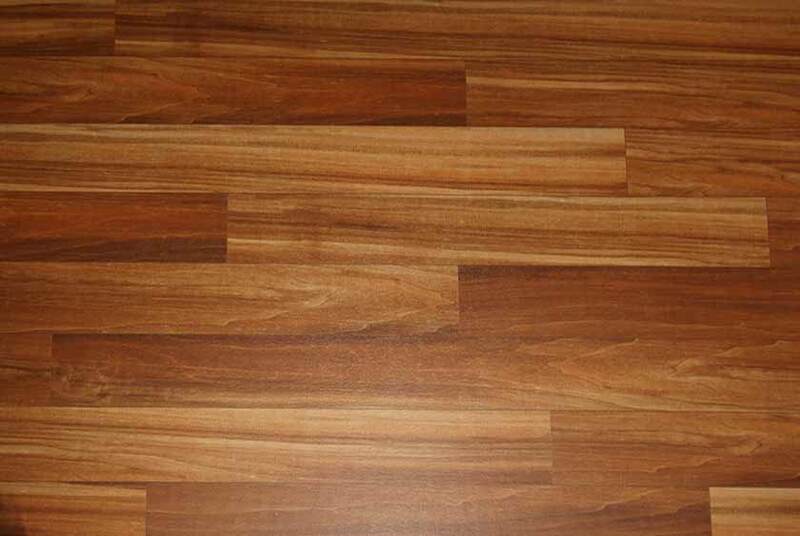 There are also wide-planked wood Armstrong floors throughout. The women’s restroom has four private bathroom stalls with floor to ceiling lockable wood doors. 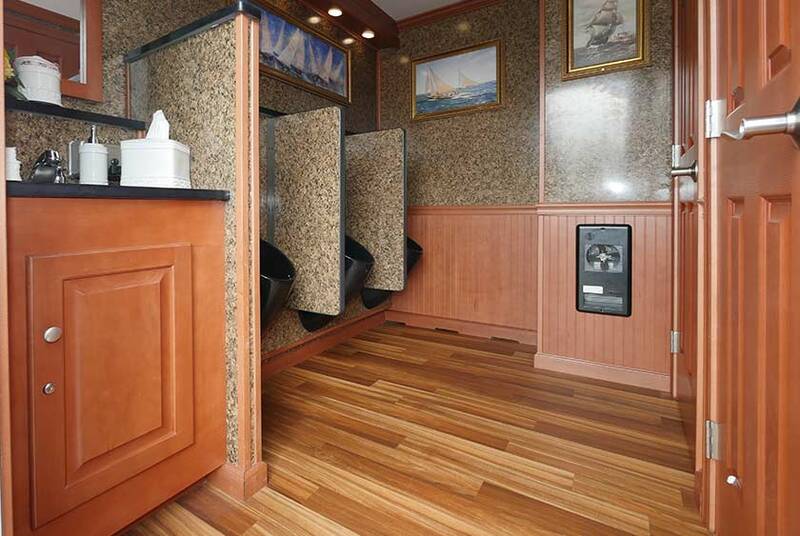 Every stall inside the YACHTSMAN Luxury Restroom Trailer has a porcelain flush toilet, brushed nickel double toilet paper holder, and a trash receptacle. 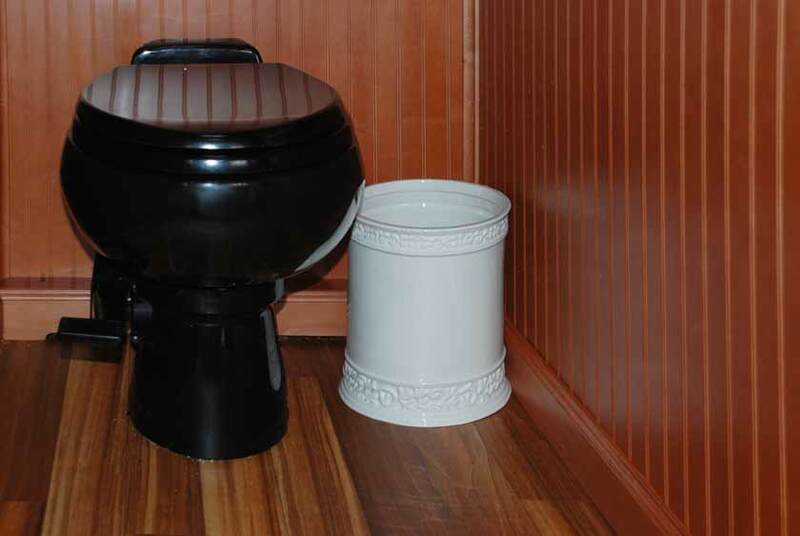 The porcelain toilet bowl has a foot-pedal flush for easy hands-free operation. 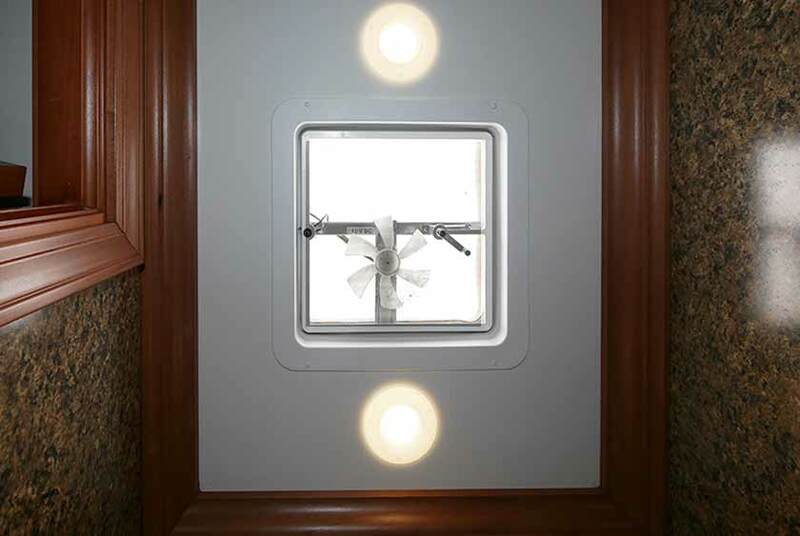 A ceiling vent inside each stall is available when you require additional ventilation. Custom framed fine art decorates the walls of every private stall. 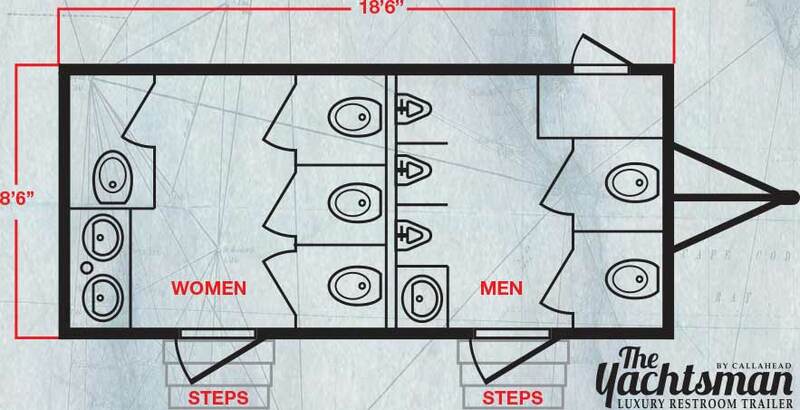 On the men’s side of the YACHTSMAN Luxury Restroom Trailer, there are two private bathroom stalls with all of the same features as the women’s side. 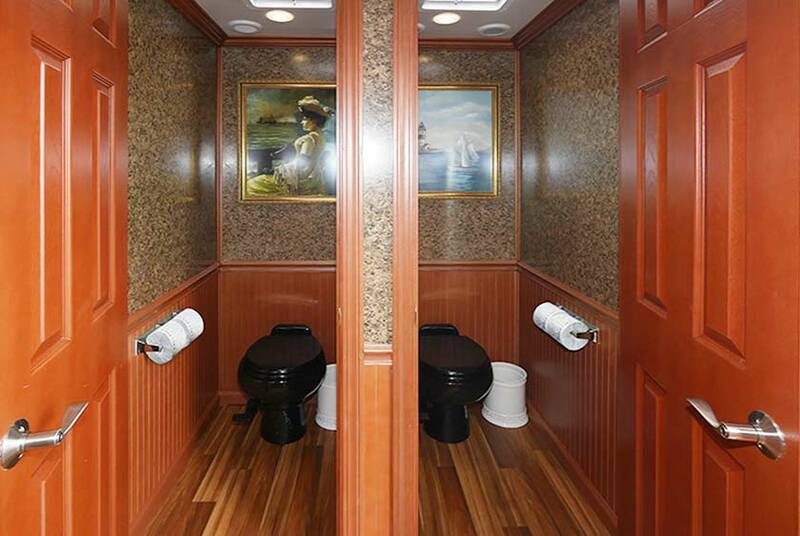 A porcelain flush toilet, double toilet paper holder, ceiling vent, and artwork is available in every men’s stall. 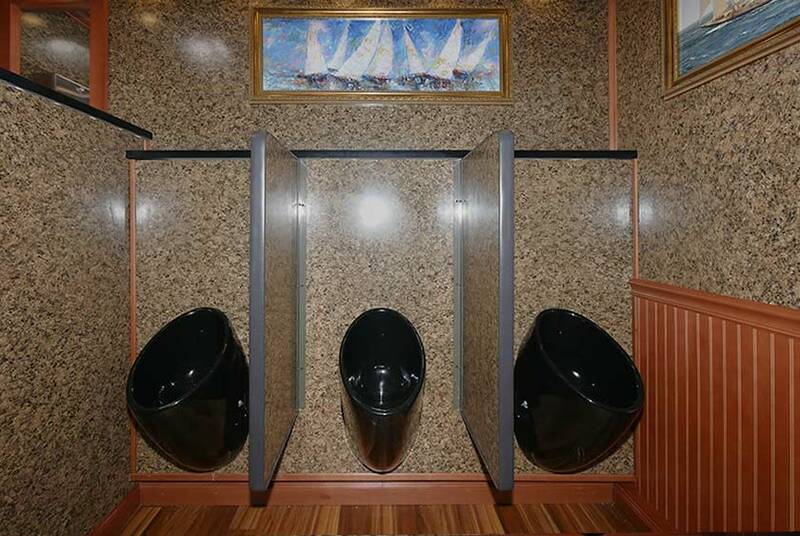 The men’s restroom also includes three black Kohler porcelain waterless urinals with privacy dividers. 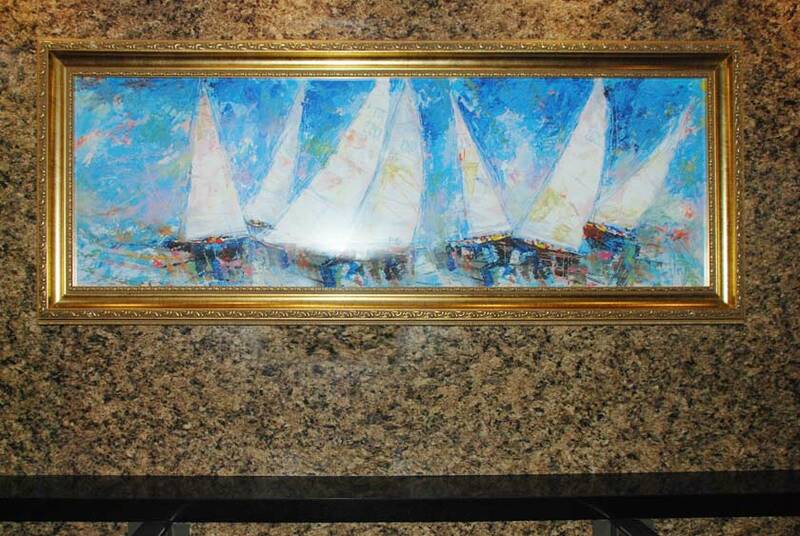 Above the urinals are a convenience shelf and a gorgeous painting of a yachting race. 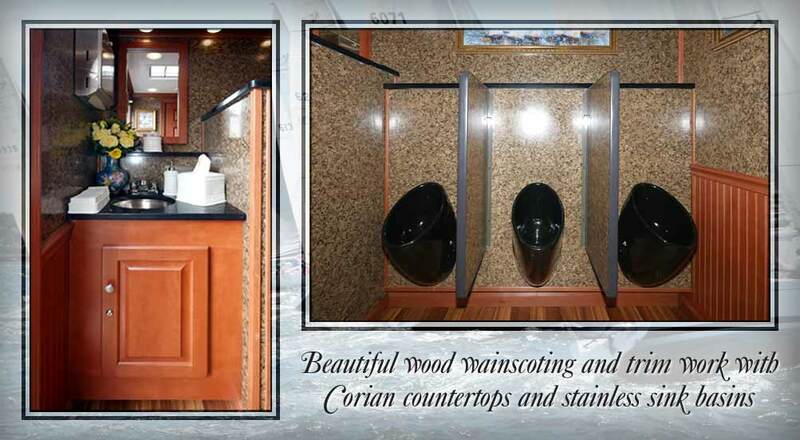 Both restrooms inside the YACHTSMAN have a vanity area with Corian counter tops with stainless sink basins. The Moen faucets have an automatic shut-off and provide hot and cold water. There are decorative, and wall mounted antibacterial soap and hand towel dispensers. 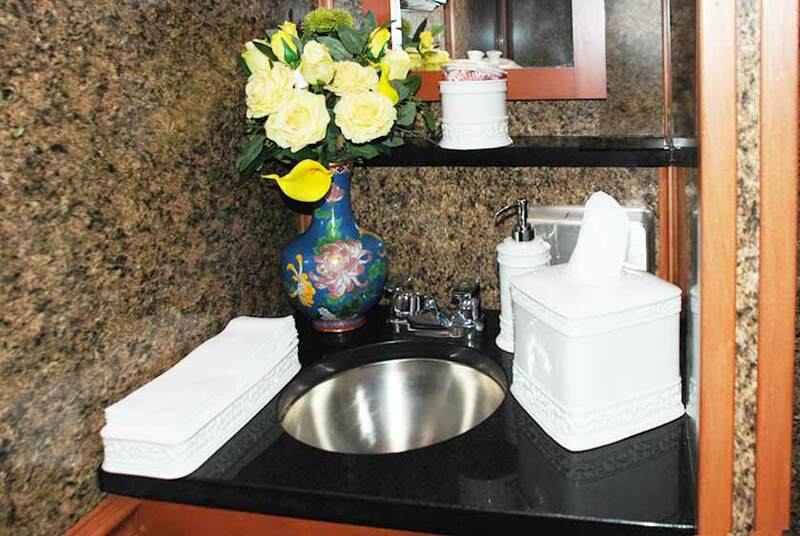 A filled tissue holder and candy dish deliver the extras you only get from CALLAHEAD luxury restrooms. 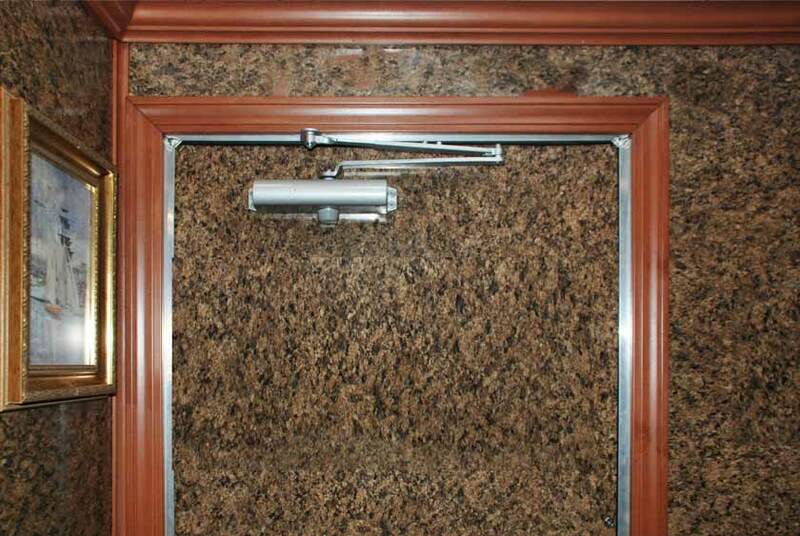 There is a wall mounted mirror above the sink and a built-in trash receptacle to help keep the restroom clean. The beautiful floral arrangement adds elegance to the restrooms setting. 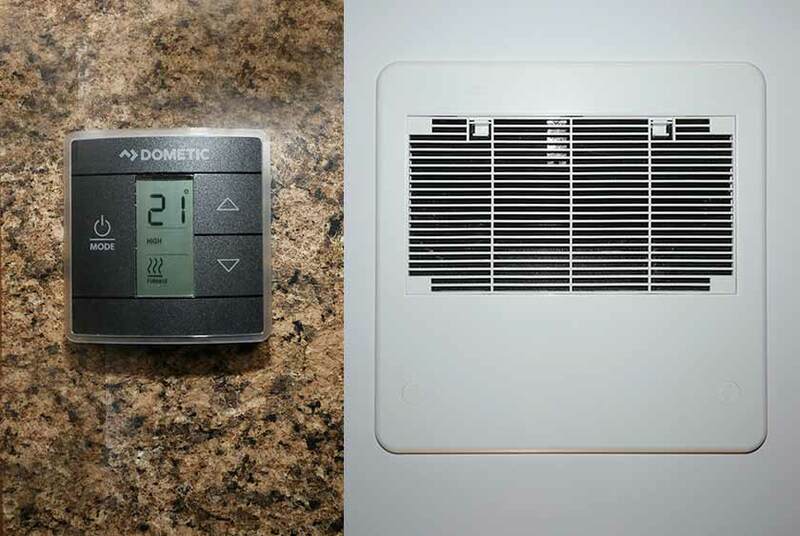 The Dometic thermostat heat and air conditioning system ensures your guests will have a comfortable trip to the restroom. 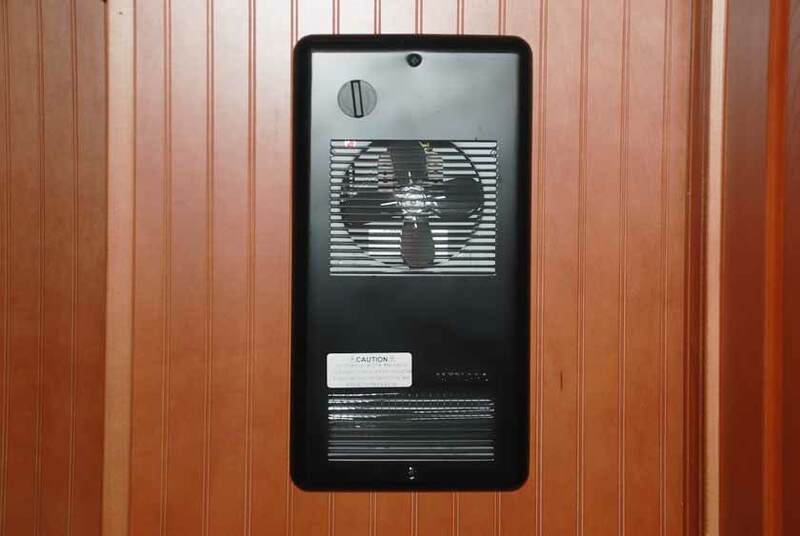 In the colder winter months, a fanforced heater is also available. 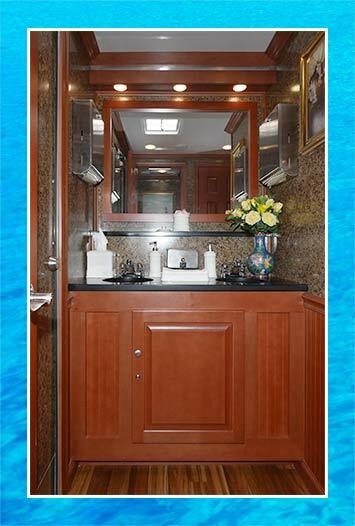 LED high hat ceiling lights delivers plenty of light inside the YACHTSMAN Luxury Restroom Trailer. Electricity for the YACHTSMAN runs on a generator or standard 110-volt outlet. 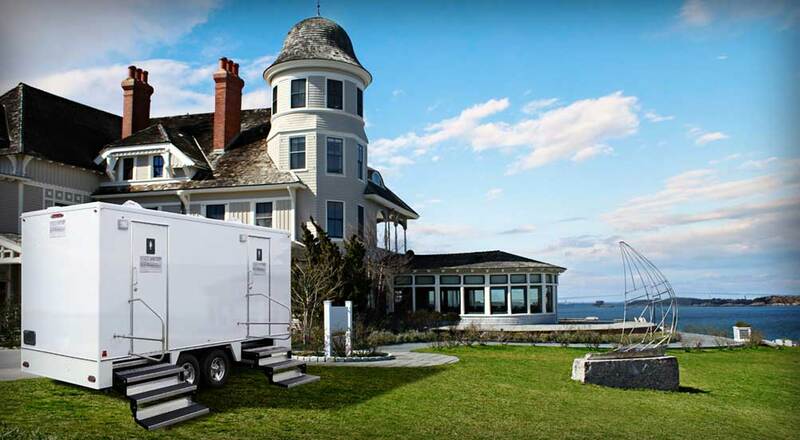 The YACHTSMAN is professionally delivered to your location and set-up will take approximately 30-minutes. CALLAHEAD cleans and sanitizes all of our equipment with only hospital grade cleaners and disinfectants for your sanitary protection. 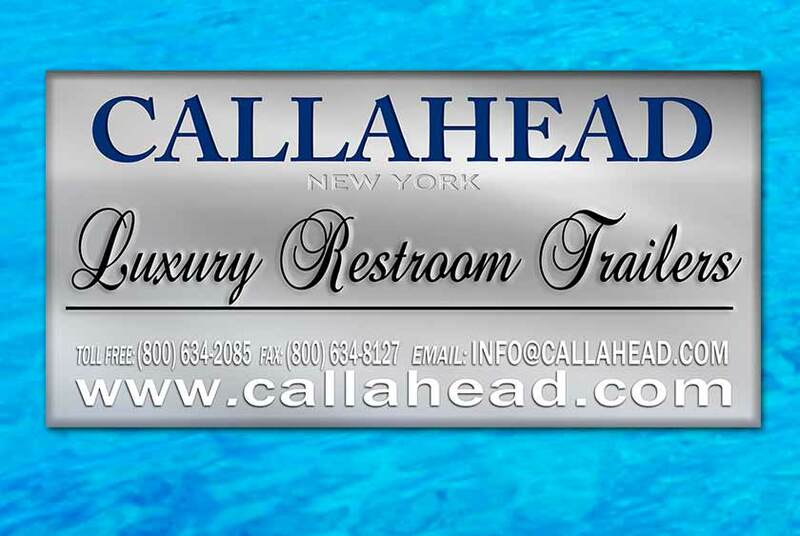 Additionally, a CALLAHEAD uniformed restroom attendant is available to keep the YACHTSMAN Luxury Restroom Trailer in perfect condition throughout your entire event. 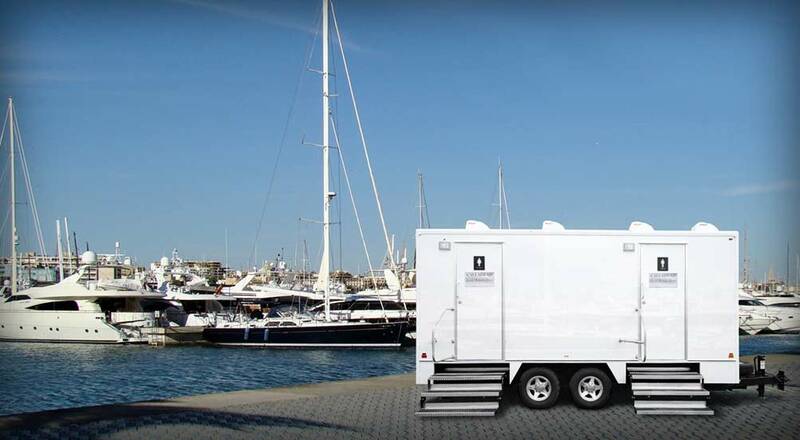 When you are having an event with hundreds of people, the YACHTSMAN Luxury Restroom Trailer will deliver 9-restroom stations that are clean, comfortable, and luxurious. 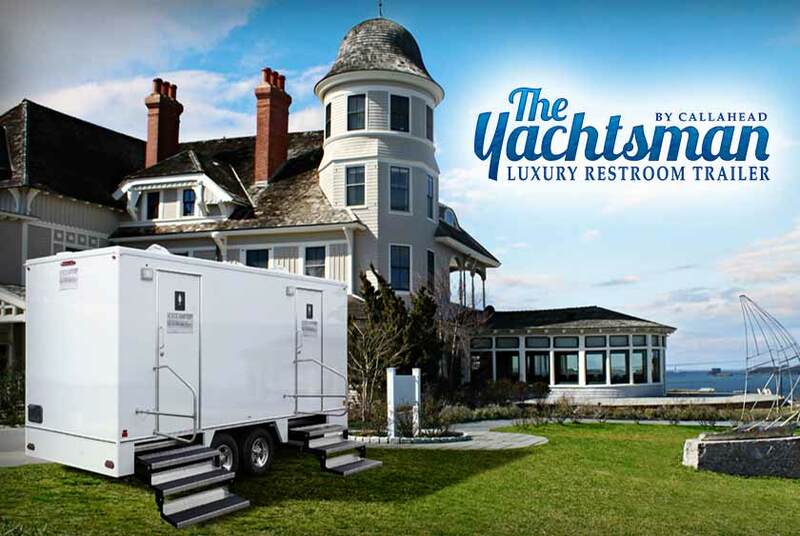 The YACHTSMAN Luxury Restroom Trailer is available for delivery throughout all of New York City’s five boroughs of Brooklyn, Queens, Manhattan, Staten Island, and the Bronx as well as all of Westchester, Nassau and Suffolk Counties. CALLAHEAD has been in business since 1976. We are the pioneers of the portable sanitation industry with ground-breaking innovations and the most extensive variety of equipment. 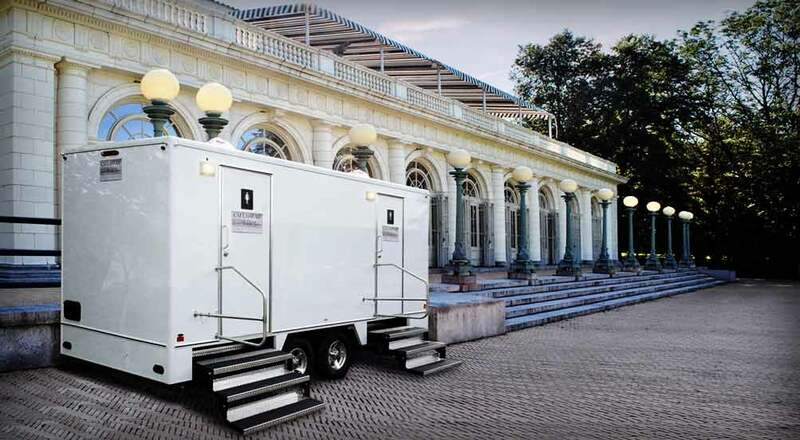 CALLAHEAD is a family business that will never stop working to deliver the world’s best equipment and service to fulfill all of your portable restroom needs. For more information about the YACHTSMAN LUXURY RESTROOM TRAILER or any of CALLAHEAD’s exclusive designs, including jobsite restroom trailers, special event restroom trailers, VIP portable toilets, standard portable toilets, porcelain toilet systems for office trailers, security guard booths, holding tanks, fresh water delivery, commercial portable sinks, portable hand washing sinks, antibacterial and hand sanitizing dispensers, portable showers and bathrooms, long-term or short-term portable toilet rentals, long-term or short-term restroom trailer rentals, and portable storage shed rentals, please contact one of our expert sales specialists at 800-634-2085 or visit our website for full photos, details and videos of our equipment for all your portable sanitation needs at www.callahead.com. 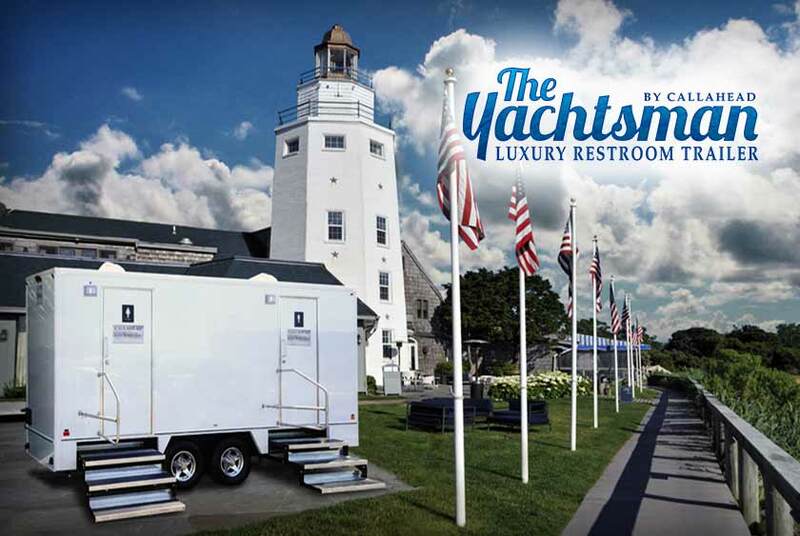 The YACHTSMAN is a CALLAHEAD 9-Station luxury restroom trailer for New York special events and short-term rental locations. When planning a special you want everything to be perfect for your guests, especially the restroom facilities. 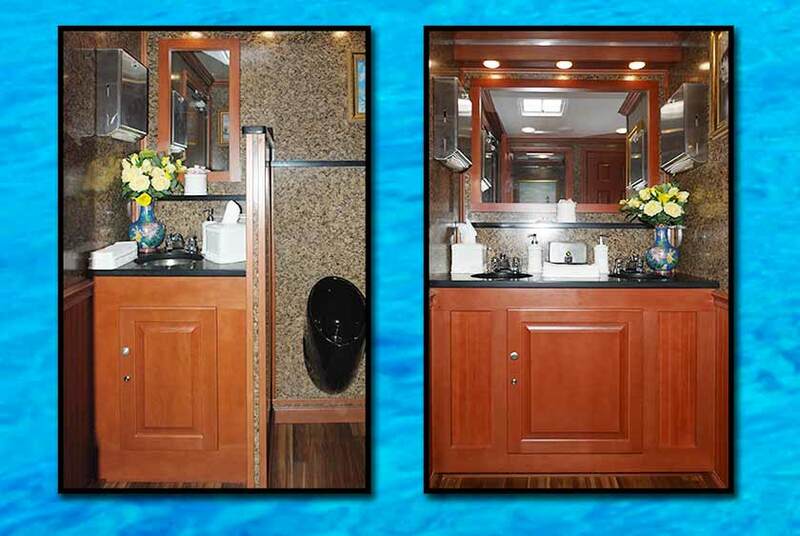 The YACHTSMAN Luxury Restroom Trailer will deliver not only clean and sanitary restrooms but also VIP amenities with an upscale décor. 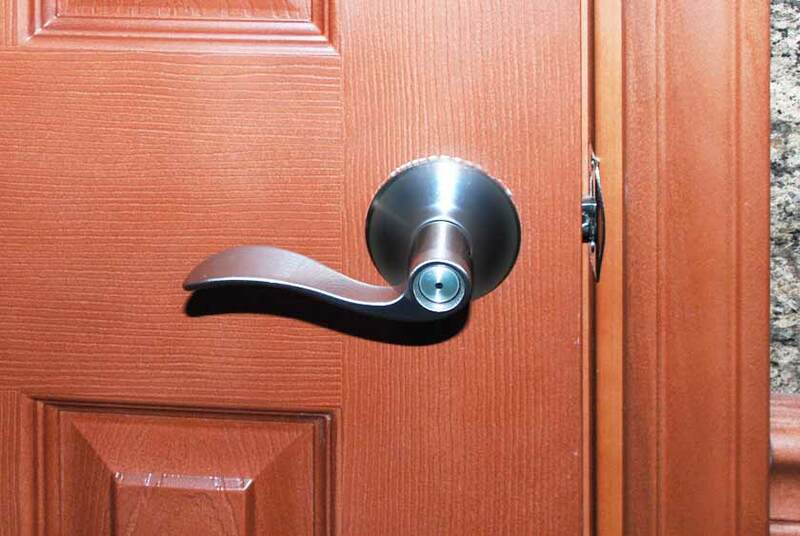 With separate men’s and women’s restrooms which includes private bathroom stalls with floor to ceiling lockable doors. 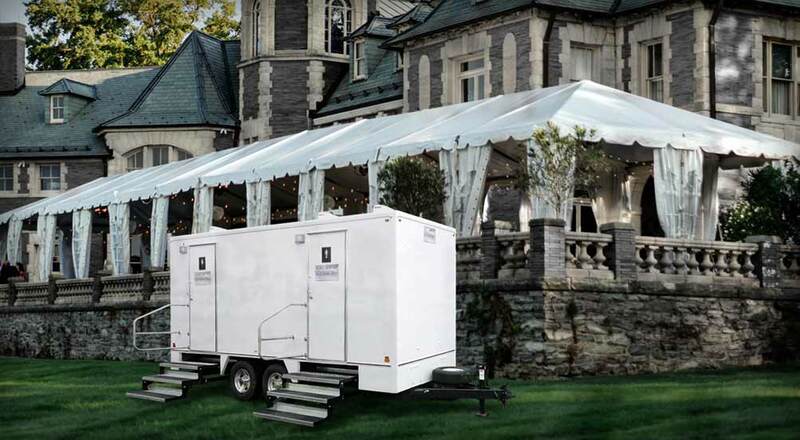 Perfect for events with hundreds of people to ensure you will not have to worry if you have enough bathrooms for your big event. Also, it has a thermostat heat and air conditioning system for guaranteed comfortable temperatures inside the YACHTSMAN any time of year. 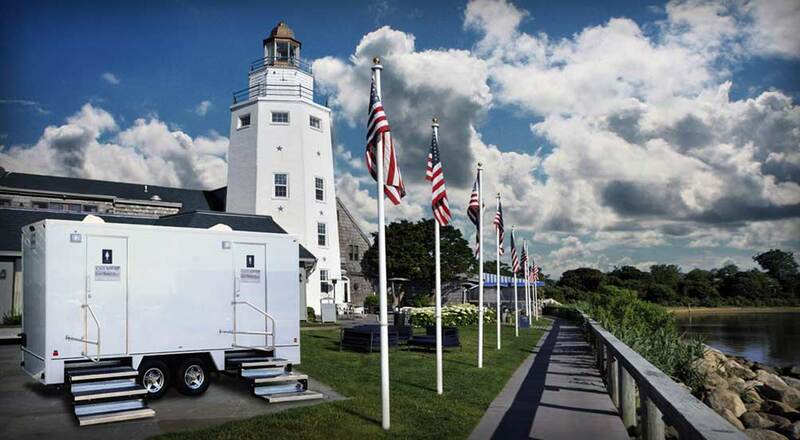 The exterior of the YACHTSMAN Luxury Restroom Trailer is a crisp white color that looks great in any location. There is also exterior lighting available for nighttime use. 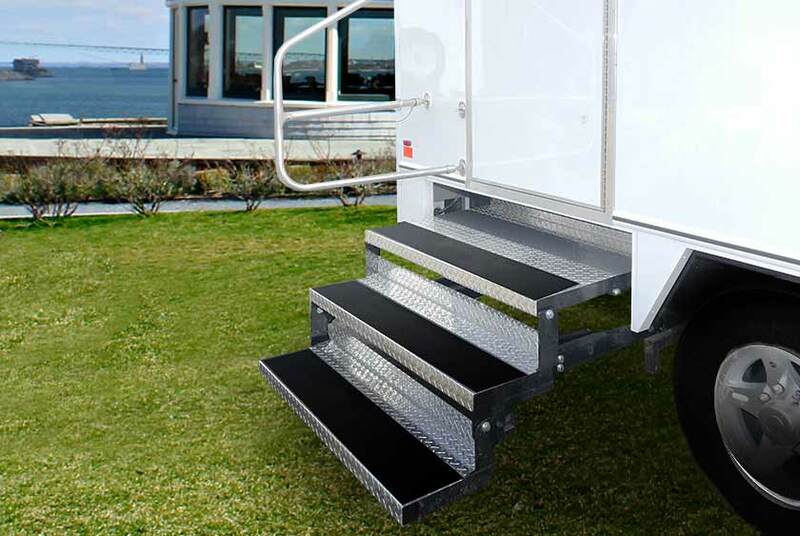 Both the men’s and women’s restrooms have a wide floating staircase entrance with stainless steel handrails. 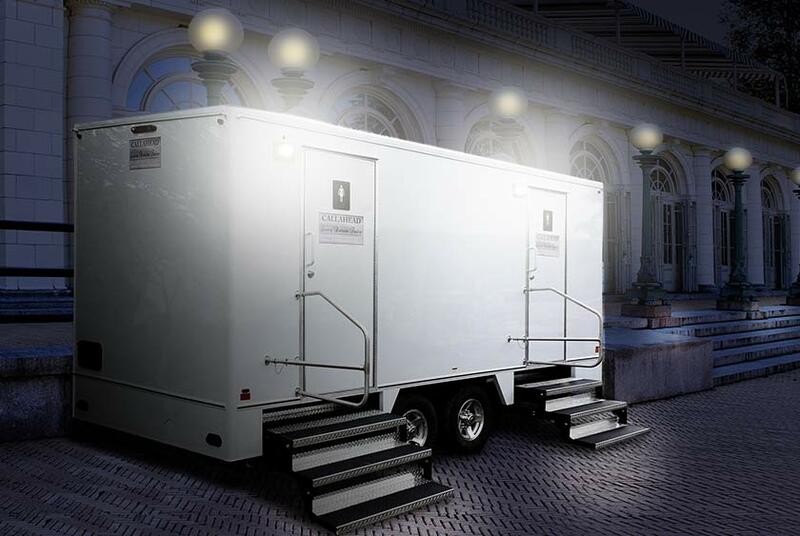 The self-closing spring-loaded door has CALLAHEAD’s signature signage on the exterior to represent the very best in restroom trailers.